$50.00 In stock. Order in the next 18 hours, 7 minutes and it will go out today! 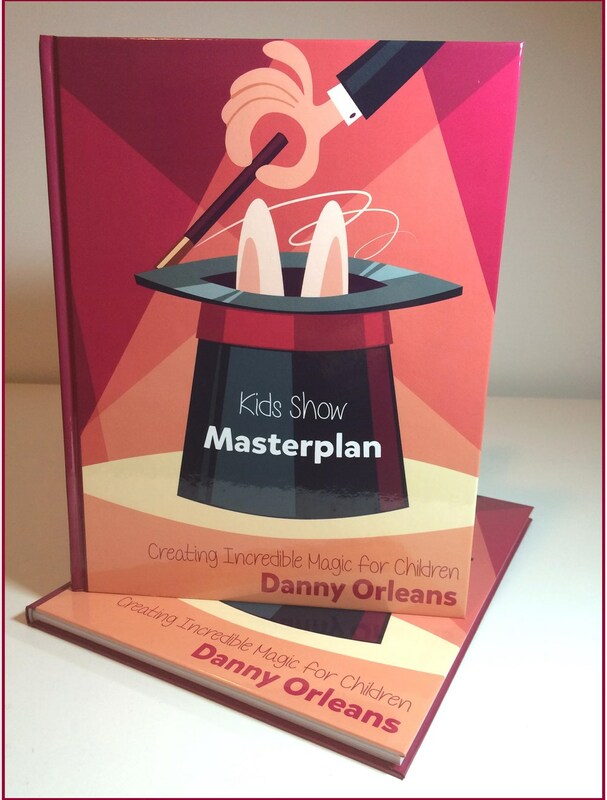 Combining his classroom experience as a preschool and kindergarten teacher with over 40 years of performing magic for children in schools, museums, libraries, private parties and theaters, Danny Orleans finally reveals his “Masterplan” on how to create and present a magic show for children. Watch the accompanying video trailer as he introduces you to the book. With more than 180 pages and 150 full-color photos and diagrams, this hard-cover volume is filled with Danny's real-world experience. He takes a step beyond his critically acclaimed DVDs to share his theory, strategy and seven unpublished routines to help you build a successful kids show. Whether you’re just starting out, or you’re an experienced kid show pro, you’ll benefit from Danny’s extensive use of child-psychology, his approach to trick selection and his multiple examples on how to deal with any room setting to maximize the impact of your show. In addition, an entire chapter is dedicated to Danny’s Onsite Marketing Plan. It’s filled with low-cost and no-cost non-traditional ideas, many of which you can begin using immediately -- all designed to increase your bookings. Danny Orleans’ credentials as an expert on performing magic for children are unrivaled: He's a former elementary school teacher who became a master kids show entertainer performing throughout North America. Just a few years ago he began to share his unique approach to working with children to the magic community. He's released two critically acclaimed DVD sets. With his performing partner, Jan Rose, he's lectured throughout the US, Canada, the United Kingdom and most recently, at the 2015 FISM convention in Italy. Be the best children’s entertainer you can possibly be. Buy, read and implement the ideas, routines and psychological strategies you’ll find in Kids Show Masterplan. If Silly Billy's book is considered by some to be the kid magician's bible, Danny Orlean's Kid show Master plan is the new testament. It is chock full of useful information that both the amateur and professional magician needs to have to make their show the best it can be! As a teacher myself, and a kid-show magician, I really enjoyed this book. It is obviously written by a former teacher, as it reads much like a proper pedagogical manual on how to become a better teacher (except instead of "teacher," it is "magician"). It starts with three very clear objectives for what the book will help you accomplish, and then goes over everything you need in order to meet these objectives. Highly recommended! Having just finished reading Danny Orleans "Kids Show Masterplan" I can say without a doubt that it's destined to become a classic. Danny will make both seasoned children entertainers and aspiring ones better at what they do! If you are a kids show magician you need this book. What a terrific reference & source book for kid show magicians. While I more or less expected the solid tips, new ideas and routines Danny has included in the book, what I didn’t expect was all the “psychology” covered & included on entertaining children. His chapter on Audience Management is some of the best material of all. Great content. Danny has an unusually high level of empathy for his audience, and that, combined with his grade school teaching background has prepared him perfectly for this line of professional work. Now we all get to benefit from it! While I’m just a part-time pro working occasionally in CT., I’m already thinking differently about a few sections of my show. Thank you Danny Orleans!